Enter 3 codes from Coca-Cola products at My Coke Rewards and get a free $20 Shutterfly credit. Once you’ve entered your codes, you will receive a one-time use code good in your e-mail for $20 off at Shutterfly. You have until December 31, 2013, to use your $20 Shutterfly credit. 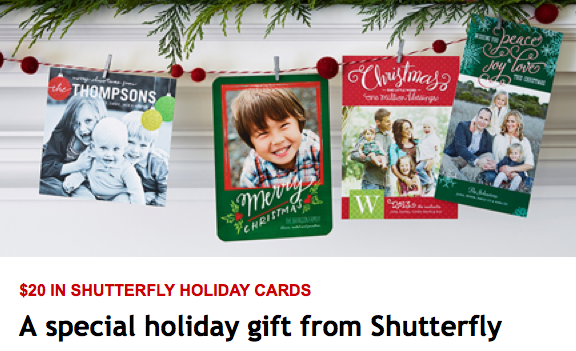 The free $20 Shutterfly credit is good on select holiday cards from Shutterfly. You have until November 30 to enter your codes, so if you don’t drink soda, start haunting the recycling bins in your neighborhood. Note: There is a limit of one credit per account and you will need to pay any shipping and handling fees, but this is still a great deal on quality holiday cards.